Wrapping Tree Trunks. Trunks of newly planted trees should not be wrapped - not with paper, not with burlap, and not with anything else. Yes, that includes red oaks. It’s a waste of money, looks unattractive, harbors insects, and leaves the bark weak when removed. Results of tree wrapping are similar to leaving a bandage on your finger too long. If you are worried about the unlikely possibility of sunburn, it’s much better to paint the trunk with a diluted white (or color to match the trunk) non-toxic latex paint. As a curative to trunk damage, use the Tree Trunk Goop. Trees grown with high nitrogen fertilizers and kept crowded in nurseries are more susceptible to burn and often in need of the paint wash. This is what the ISA (International Society of Arboriculture) has to say about wrapping. Many early references recommend wrapping the trunks of newly planted trees to protect against temperature extremes, sunscald, boring insects and drying. More recent research indicates that temperature differentials at the bark are greater with tree wrap than without. 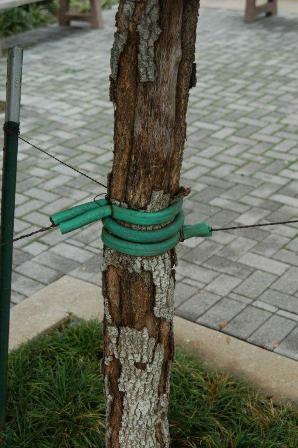 Further, tree wrap tends to hold moisture on the bark and can lead to fungal problems. Also, insects tend to burrow between the bark and the wrap and can be worse with wrap than without it. Staking and Guying. It’s usually unnecessary if the tree has been planted properly with the earth ball size of at least 9” of ball for each 1” of trunk diameter or bare rooted – more on that later. Staking is a waste of money and detrimental to the proper trunk development of the plant, is a maintenance problem and is dangerous. Staked trees consistently produce less trunk taper, develop a smaller root system and are more subject to leaning when the stakes are removed. In rare circumstances (sandy soil, tall evergreen trees, etc.) where the tree needs to be staked for a while, connect the guy wires as low on the trunk as possible and remove as soon as possible. It can also cause damage to the cambium layer even when soft materials are used. There are now alternative systems that use metal or wooden stakes that hold the root balls firmly in place and have no aerial parts. More on that later. Mulching a Newly Planted Tree. Mulch the top of the ball after planting with 1" of compost and then 3" of mulch tapering to 0" at the tree trunk. This step is important in lawn areas or in beds. Do not ever plant grass over the tree ball until the tree is established. Examples of good and bad planting techniques.